If you are looking for a great property "to do the lake" from, then SEAS THE DAY is it. This cottage is perfect for a smaller group. One bedroom has a queen size bed. Another bedroom has twin size bunk beds. There is another bedroom downstairs with a full size bed, kitchenette, bathroom, and a deck. There is a total of 3 outside decks, 1 outdoor grill, several outdoor sitting areas, fabulous lake views, and an awesome dock with a covered boat slip and swim platform. It is located down from Indian River Marina. The next marina via water is Whitman Hollow Marina. SEAS THE DAY is in the Big Creek area, across from Mile Marker 8. This side of the lake is a jewel. It offers smooth waters for tubing, skiing, and swimming. There are numerous coves to explore, and tends to be less busy than some of the other parts of the lake. This cottage is tastefully decorated, comes with just about all one needs to be comfortable, and is a great place to come back to after playing on the lake for the day. If you need supplies, Food City, Wal-mart, Walgreen's, CVS, and more, are literally 5 minutes away. Yet, you are in a quiet, peaceful, pretty area, with a 34,000 acre lake right in your back yard! How cool is that?! We, as owners, have worked diligently to make it (and keep it) a place that folks will want to come back to again and again. Should you have a larger group, we also have 2 other cabins in the same area, one being next door and the other a few doors down. You love your family and friends, however, additional lodging provides an opportunity to be together but not 24/7. There is a really nice fire pit between SEAS THE DAY and ONAWIM, (next door) that makes for a favorite gathering place in the evening. Each cabin has their own private boat dock and swim platform. The other lake front properties can be viewed on vrbo.com ad 127695 and vrbo.com ad 726359. All cabins are people and pet friendly! We hope you come and check us out. We are confident that you will not be disappointed. FYI: The number of steps to the lake are from between 50 to 110. +/- (depending on which cabin you choose and the height of the water, as it vacillates) If you have members of your group that find steps difficult, the marina is close by. You can drive down there, load your boat with goodies and any folks that are unable to navigate the steps. My husband and I both grew up in the Midwest. We met in Minneapolis, MN and married in February, 1984, moving to Kentucky in August of that same year. There we had three sons, but our love for the lakes (Minnesota, the land of 10,000 lakes) kept our thoughts of heading back that way percolating in the recesses of our minds. However, we discovered Norris Lake back in 2000, and the rest, as the saying goes, is history. We have made many memories here with friends and family over the years. We nurtured a vision of growing our slice of paradise so we could share this area with other lake-lovers and have been fortunate enough to make that dream a reality. 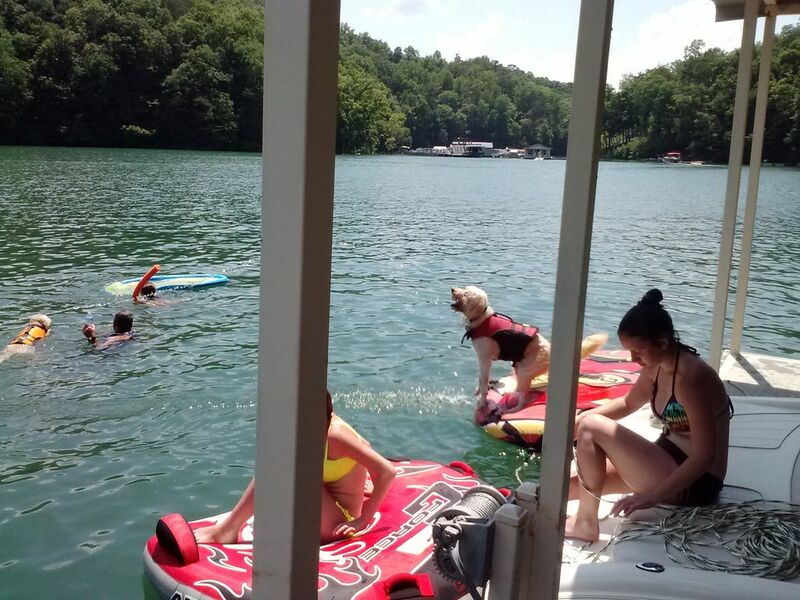 We now offer three cottages here in the Big Creek area of Norris Lake and have spent a tremendous amount of time and energy making this a family-friendly place for you to come to year after year! From the awesome swim/boat dock, pontoon boats, kayaks, to the decks and fire pit, SEAS THE DAY is a great place from which to enjoy the lake. We are confidant that you never tire of the beauty in and around Norris Lake. It is a feast for the eyes! Additionally, East TN is a HUGE play ground. Not only does is it home to one of the prettiest lakes, but there acres and acres of land dedicated to hiking, four-wheeling, hunting, biking and horseback riding. The outdoor enthusiast has a cornucopia of options! C'mon and enjoy! We choose this area not only because of its proximity to I75 and to town, but also for its privacy, its peace and quiet, and feeling of getting away from it all. The fact that the cabin is on a dead end lane lends itself to those qualities. There are two marinas in close proximity to SEAS THE DAY. They are Indian River Marina and Whitman Hollow marina. This end of the lake has a plethora of coves to hang out in, rocks to climb and jump off of,and rope swings. It offers nice and smooth areas to ski or tube, and plenty of places to dangle a fishing line. At night, the star-studded sky is something to behold. It is my humble opinion that it doesn't get much better than this! As a guest here, you will really enjoy the night sky, the summer night sounds of crickets, owls, cicada bugs, the sun coming over the mountain in the morning, the swim area, the fire pit, the decks, the dock, the peace and quiet....I could go on and on. Additionally, it is conveniently located close to town. Food-city and super Wal-mart are approx 5 minutes away. Lowe's, Wal-Green's, CVS, hospital, Liquor barn, etc., all are nearby. If you have to make a beer run or an ice-cream run, it won't eat up much of your day, where you really need to be out on the lake! Just down from Indian River Marina. Next marina is Whitman Hollow. Area of lake known as "Big Creek". Great for all kinds of summer fun....skiing, tubing, swimming, sunning. Approximately 100 steps to the water. No land line but good cell phone service. Please take note of this and make arrangements for your communication needs. A combination of central air, a window a/c unit in the family room, and 2 ceiling fans. One is in the bedroom with the queen size bed and the other one is in the family room. A combination of central heat and propane heat. Please make provision for your own laundry supplies. Washer and dryer in the cottage for your convenience. Off street parking for up to 2 cars. Please communicate with owner if more than 2 vehicles will be expected. Additionally, inquire about places to park a boat trailer, if applicable. A limited number of towels are provided. Please provide your own swim towels. There is a living room and a family room. Just your normal drip coffee maker. Dishware to serve up to six. Plenty of cookware, coffee pot, coffee filters. Fully equipped kitchen. Refrigerator, stove, oven, toaster oven, microwave, dishes, silverware, utensils, cups, wine goblets, etc. Inside dining area in the family room, seats six. Kitchen bar sits three. Outdoor dining seats four. Some dvd's available here at this property. Owner also has several. Inquire if interested. Also, local establishments provide dvd's to rent. There is a nice sized lot with this cottage, but the majority of it is on a hillside. There is a pontoon available for you here at this property. Please inquire to its availability and price. Also, kayaks. 2 decks. Each deck has nice views of the lake. There are three really nice tennis courts in the area. Several golf courses around, the most popular being the Greens at Deerfield Resort, approx 20-25 minutes away. It is possible, but not ideal. Although the lake is the major draw, there are numerous other activities and things to do. There is a zip-line near by, hiking, four-wheeling, the Appalachian Museum, various cultural events here and Knoxville, horseback riding, the Knoxville Zoo, bike trails, to name a few. Linda was a great host and we thoroughly enjoyed our time in the cabin! The area where the home is was very quiet and peaceful. It's tucked away from the main town yet close enough for quick trips to the store if needed or a quick bite to eat. The home was very cozy. It's gives you a warm country feeling in the mountains. The lake was beautiful and the patio gives a nice view of it if you don't want to walk down to the dock. The home was nicely appointed, comfortable, and clean. It was very nice to know that our host was close by if we needed anything (which we didn't because everything was in great working order). We stayed for Thanksgiving to get away from the city life and have some quiet family time. Our stay was perfect. Thanks for everything Joanne! Awesome to hear you had an enjoyable Thanksgiving weekend at this property. For the most part, the weather was fabulous! Hope you can come again! A beautiful cottage by the lake! Very peaceful and quiet, just what we were looking for! The house was in a great location, easy access to the dock, and close to the marina. We had everything we needed such as cooking utensils, dishes and towels. We had a great time. We loved the house and especially the area on the lake! This was our first trip to Norris Lake with our family including our 2.5 yr old and dog. The property is secluded and quiet. The steps down to the lake were more than what we expected. You have to go all the way around the house to get to the steps. One part of the house is blocked off, which would’ve allowed a much shorter walk to the lake. It was a lot to go down with our toddler - our legs definitely got a workout! The cabin is well furnished and the perfect size for our family. It is a bit dated, but is clean. We rented the pontoon boat for one day and had a blast. Just swimming, exploring and cruising the lake. The dock was so nice to jump from and just swim in the lake. The owner lives near by and is really helpful with renting the pontoon, recommendations for the area etc. Hey Debbie - Unfortunately, steps are unavoidable in East Tennessee! We recently upgraded the cabin but agree that we still need to replace the dated blue carpet in the living room. We always try to make things as comfortable as possible for guests so they feel like they can put their feet up and totally relax! We find that purchasing brand new, trendy furniture does not lend itself to the 'put your feet up' feeling we like to convey. Glad you guys enjoyed your stay! !